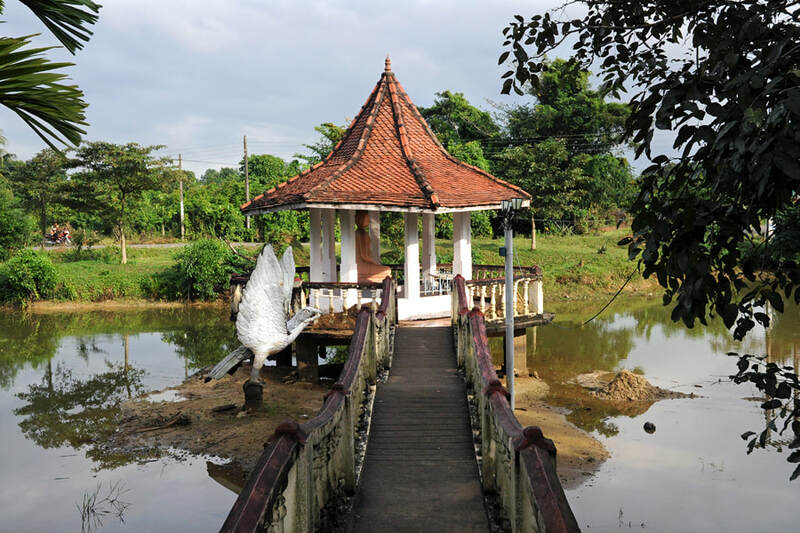 Dadagamuwa Rajamaha Viharaya, situated 12 km northwest of Gampaha and 2.5 km south of Veyangoda, is a typical Sinhalese village temple, with a meditation centre and a Sunday school. Dadagamuwa is not a must-see, but an ensemble of typical village temple buildings. One special feature is a hall which is called Vatadage, a roofed building containing a small stupa. 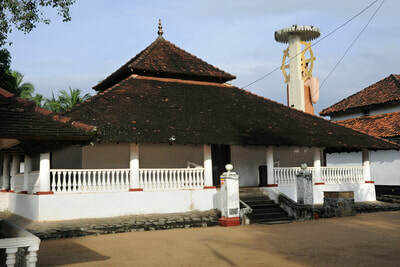 The main building of the Dadagamuwa temple is called Vatadage, though it is not a circular but a quadrangular structure. “Vatadage” translates to “round house”. However, the term refers not to the form but to the function. It’s a building surrounding a stupa, allowing circumabulation of the small stupa under a roof. The architectura term for this kind of building surrounding a stupa is Chetiyagara, translating to “stupa house”. Because most of the ancient Chetiyagharas are circular structures, the term “Vatadage” has become more common in Sinhala language than the ancient Pali term. This is why it is also used for some rectangular structures, too, as in the case of the Dadagamuwa Rajamah Viharaya. Even more confusingly, there are different spellings of “Vatadage”. For instance “Watadagaye” is used on the Dadagamuwa temple’s homepage. 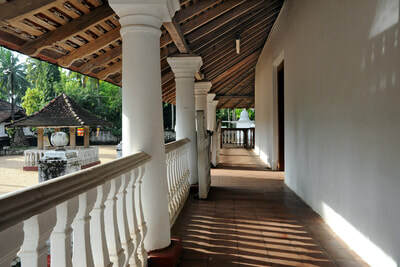 The Vatadage of Dadagumwa is from the late Kandyan period, the pillars of the porch are influenced by the colonial architecture of the coastal plains. The roof of the Vatadage vonsists of two decks sloping in four directions. The architecture is from the Kandyan era, though not in the typical Kandyan style. The original paintings in the inner room were from the Kandy period, too. But they were restored in the late 19th or early 20th century. They depict Jataka stories, a typical theme of Kandy paintings. The Dadagamuwa temple claims to have been founded by a provincial governor named Sumitta of Sri Lanka’s first Buddhist king, Devanampiya Tissa. Actually, some stone pillars and a Yantra Gala were found that can be dated back to the Anuradhapura period. A Yantra Gala, also named Nidan Gala is a huge rectangular slab with small chambers rifled in a square pattern, usually 4 b 4 or 5 by 5 holes. They contained small funerary objects, the entire Yantra Gala was placed horizontally below the main relic casket inside the funerary chamber of an ancient stupa. 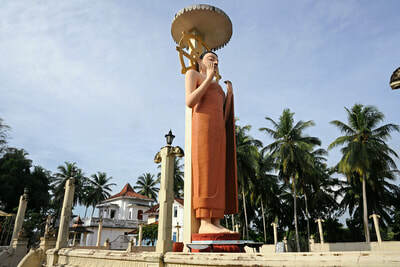 A large standing Buddha statue was built recently, the gesture is the uncommon Asisa Mudra known from the classical standing colossus of Sri Lanka, the Aukana Buddha.